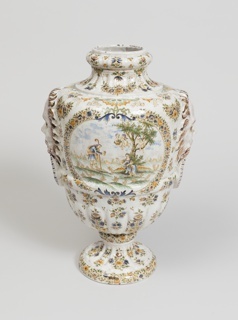 This exhibition was on display from May 20, 2017 to April 29, 2018. 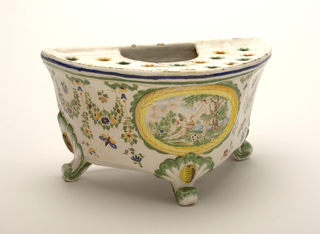 How did the small village of Moustiers-Sainte-Marie, dramatically perched on the cliffs of the Alpes-de-Haute-Provence, become one of France's major centers producing faience—tin-glazed earthenware—during the 18th century? 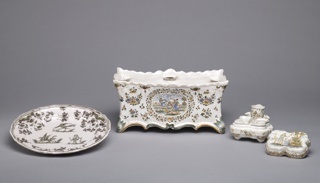 Its success can be partly attributed to the natural resources of the region: fresh water, good clay for potting, and abundant wood to fire in kilns. 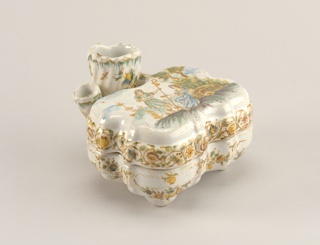 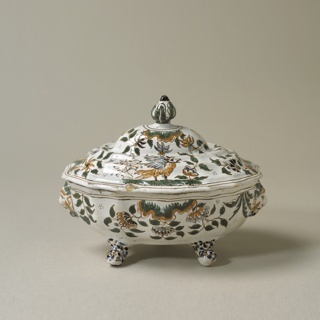 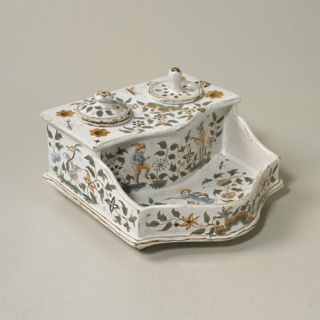 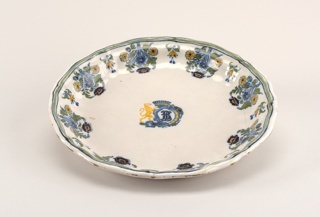 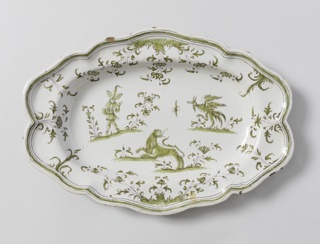 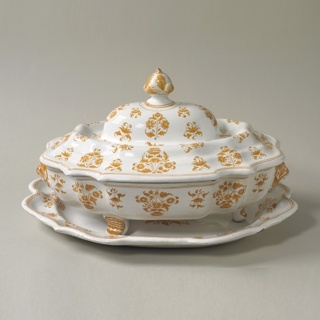 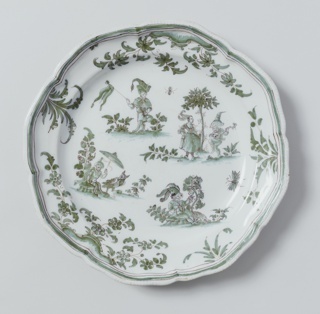 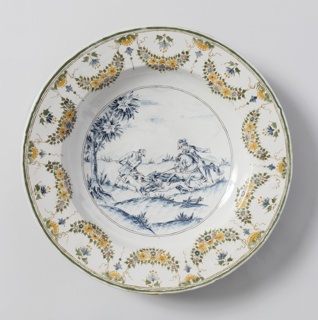 When King Louis XIV issued a series of edicts requiring French nobility to melt their silver table services to fund French war efforts (from 1689 to 1709), faience manufacturers were quick to provide ceramic services instead. 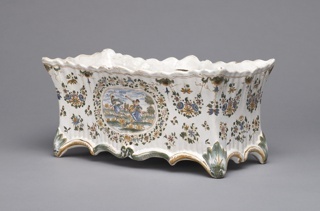 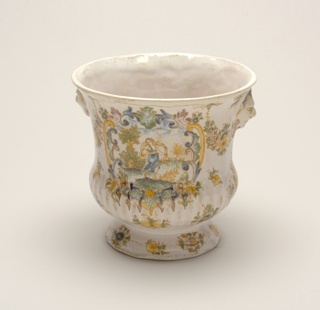 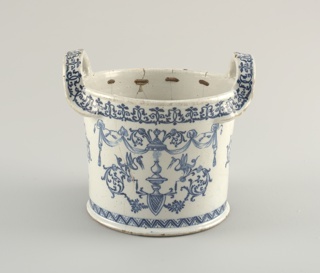 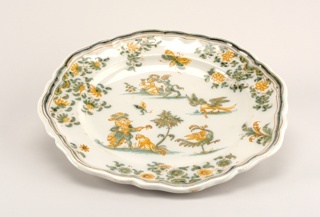 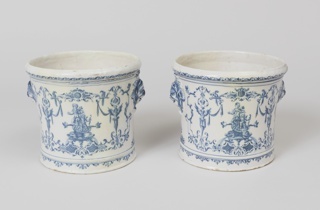 The king held a monopoly on porcelain production in France, so other wealthy patrons chose faience. 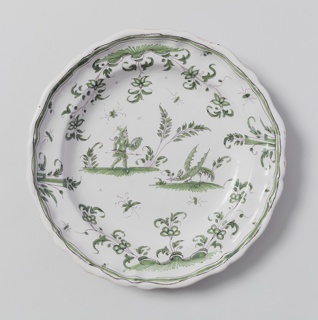 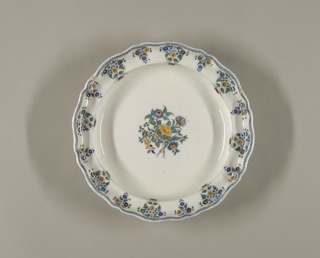 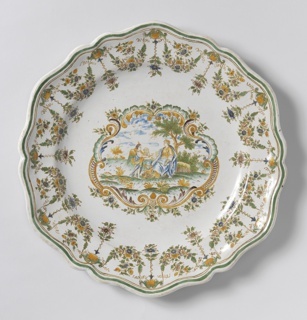 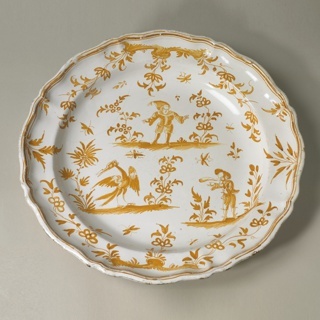 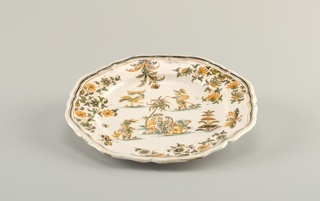 Entrepreneurial pottery owners pursued regional clientele, as evidenced by table services painted with arms of influential Provençal families. 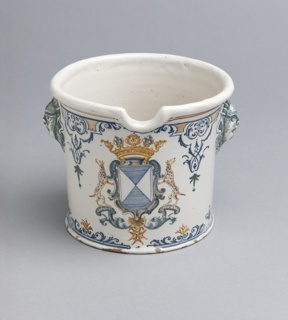 Moustiers pottery decorators fueled demand by developing motifs that would become imitated by other factories. 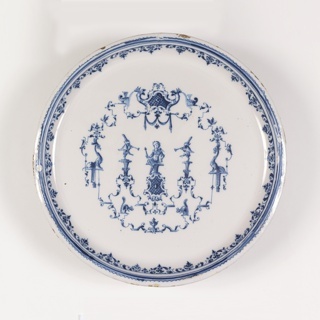 Using colors derived from metal oxides, decorators painted these motifs onto a white surface—often compared to a blank canvas—created by the tin glaze applied to the clay. 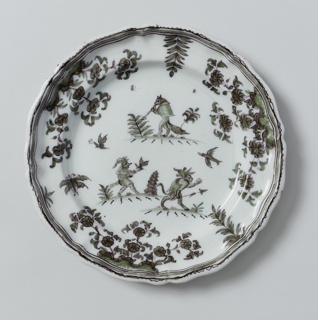 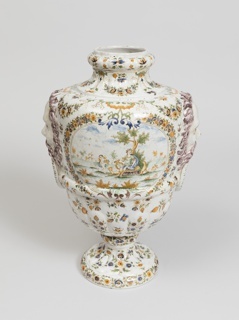 The decoration of Moustiers ceramics was partly inspired by and coordinated with chintz—decorative white-grounded Indian cotton fabrics being produced for the European market that were used in interiors. 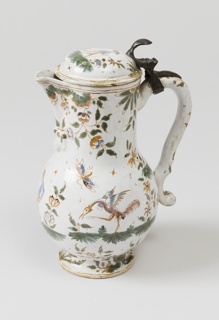 The enormous popularity of this cotton threatened the French silk industry, prompting the ban of imported chintz from 1686 to 1759. 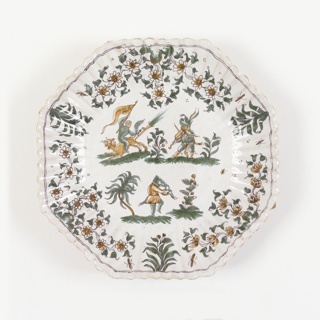 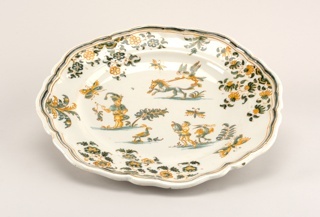 During this time, the decorative repertoire of Indian chintz motifs—flowers, insects, and exotic figures—appeared on faience from Moustiers. 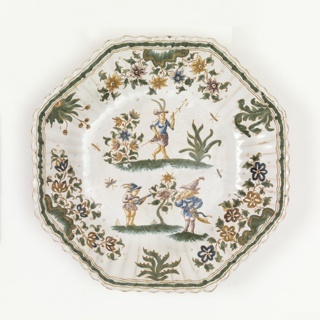 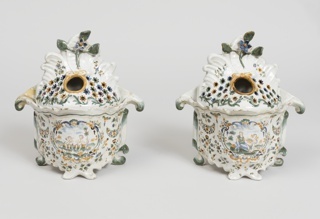 The exhibition celebrates the substantial gift of Moustiers ceramics from the Eugene V. and Clare E. Thaw collection, donated to Cooper Hewitt between 2006 and 2017. 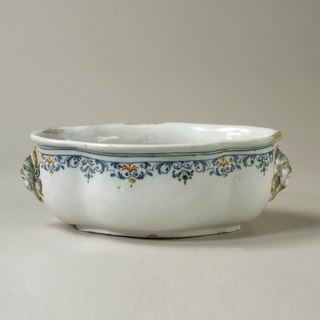 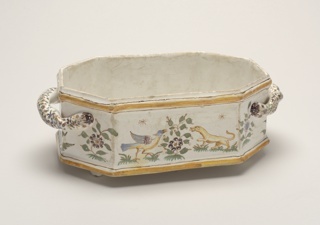 The Thaws' first piece of Moustiers faience—a wedding present from a friend—ignited a desire to explore the many varieties of ornament and form found in the two major family firms of Clérissy and Olérys around Moustiers. 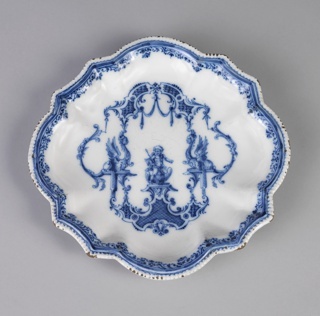 The exhibition includes prints and textiles from Cooper Hewitt's collection that not only served as inspiration but were often used alongside these works in domestic settings.